HEPI is today publishing The Comprehensive University (Occasional Paper 17) by Professor Tim Blackman, the Vice-Chancellor of Middlesex University. The report argues the comprehensive ideal is the best way to fix how the UK’s class-based university system is holding back social mobility. a funding system that reflects the benefits of higher education to both the individual student and wider society. The UK’s higher education system is said to be one of the best in the world, but it is failing to make the contributions to tackling social inequality and poor economic productivity that our universities could make if regulated in a different way. The root of these problems is academic selection, which has created a sector based on social class advantages rather than recruitment and teaching practices that equalise opportunities. The narrative of “leading” and “top” universities has marginalised the transformational potential of higher education, which lies in adopting comprehensive principles. Mixing students of different backgrounds and abilities and teaching them together would force more universities to develop their teaching expertise, but there are many added benefits. Evidence shows that less selection and greater diversity would create a better learning environment for all students, and it is much the best and most cost-effective way to widen access. Tim Blackman’s case for comprehensive universities is radical and will no doubt ruffle feathers but it is also based on strong argument and powerful research. I was particularly struck by the evidence he presents on the efficacy of mixed ability teaching in American higher education, evidence which reinforces similar findings in schools. Forced to choose between ploughing more funds into schemes that do not deliver value for money or a relatively simple regulatory change that is guaranteed to shift the dial, my policy wonk brain plumps for the latter. This is one of the most thought-provoking papers ever published on UK higher education. It exposes how, as a country, we have embraced comprehensive principles for schooling but rejected them for higher education. If we want to make a step change in social mobility, it makes sense to stand back and look at the big issues afresh – including our very selective university entrance system. Many people will balk at the radical policy proposals here, but everyone who cares about the impact higher education has on individual people’s lives and on society in general should engage with these arguments. 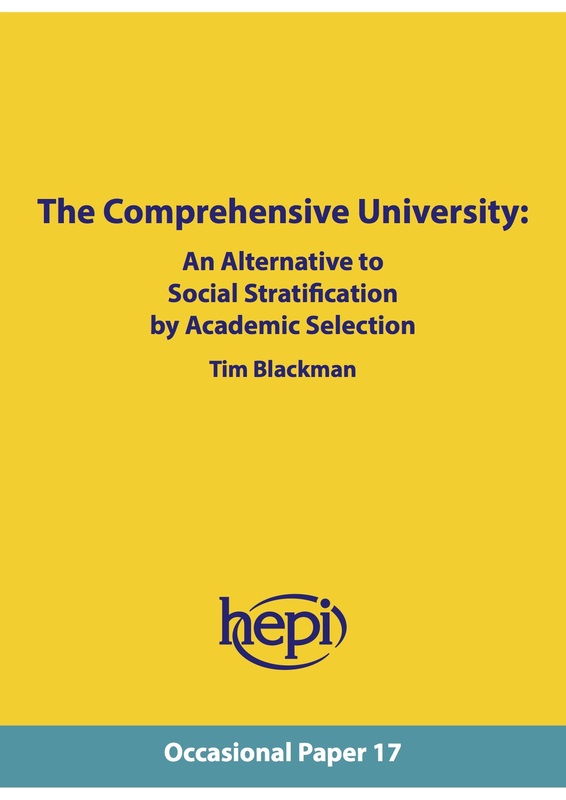 The Comprehensive University: An Alternative to Social Stratification by Academic Selection by Professor Tim Blackman is being published as part of HEPI’s Occasional Paper series, which look at old issues in bold new ways, underscored by evidence from the UK and elsewhere. It is written by the author in a personal capacity. Complete leftist rubbish. Diversity more important than ability? Yoy may get away with it in the gender, ethnic and social studies world. What next, sorry Usain, we sont operate selecton in the 100m any more, so Professor Blackman wins! An extremely bad idea, which would result in rich and intelligent students going to elite universities in the USA instead; and would destroy our world-beating universities, which currently rank higher than their more egalitarian European counterparts. University teaching works because it is academically demanding and because one’s peers are (roughly) as intelligent. Whilst mixed-ability education works well for distance learning, where the pace and intensity can be varied, for traditional universities which operate a full-time campus-based model, lectures, tutorials, classes, and seminars would be extremely difficult to manage. Consider, for example, the difficulty in running a mathematics degree where part of the intake struggles with precalculus while other students can solve second-order differential equations in their heads. Would a mixed-ability university duplicate degree programmes to overcome this problem? Or would classes be dumbed down, or the less able students drop out? Comprehensive education in the United Kingdom has hardly been a success – the rich drop opt out, either through paying for private schools or expensive houses in the catchment areas of good schools; and intelligent children who are poor are often only academically stretched when they begin studying at (an academically selective) university. (Working-class acceptances to Oxford and Cambridge were highest before grammar schools were abolished, suggesting that the British education system needs more academic selection, not less.) Consider, for example, how ethnic minority children from poor backgrounds whose parents can’t afford expensive schools build better lives for themselves: they work hard at school, get into selective universities, where they read useful subjects (notice how Chinese or Indian students rarely study sociology…), get good jobs, and build better lives from themselves. If universities stop being selective, the effect will be to destroy social mobility, not to enhance it. The purpose of universities isn’t to engage in social engineering, but to impart knowledge and further develop the ability to reason; deviating from this focus on pedagogy and scholarship to pursue a hard-left political agenda would destroy them. You seem to have a cargo cult mentality build the forms and the cargo will flow. The reason why education was the route to social improvement is it was limited to the cognitive elite (those with high IQ). By opening universities to lower IQ’s it simply devalues the degree and wastes resources. It might focus attention on higher education really adding value rather than acting as a very expensive IQ test. And there is very good evidence that IQ only really predicts performance, especially expert performance, at early career stages. There is plenty of evidence that selection is a highly arbitrary and pretty inaccurate process, so it certainly doesn’t guarantee that the brightest and the best all end up sitting in the same seminar room. My (admittedly dated) experience of being a student at Cambridge was that there were a surprisingly large number of quite stupid people amongst my peers, so I have some experience of the comprehensive university. The lower streamed students shared the characteristic of being quite rich, and mostly privately educat5ed. An alternative method of getting people with mediocre minds into the more shiny universities seems to offer gains in social mobility (and probably an overall improvement in the manners of the undergraduate body).The world-beating reputation of some of our universities depends on their research (and endowment wealth) rather than the quality of their undergraduates, which for centuries had been a very low priority for them. The contributor who implicitly argues for a return to the grammar schools on the tired old basis that this enabled social mobility should try and imagine the leap in poor and disadvantaged kids going to our “elite” universities if the system proposed were introduced. As an alternative to the winner-takes-all system that we currently run, one which made most (if not all) of our universities pretty good seems quite attractive. And I, for one, don’t really care if the rich spin off to the USA. Rubbish. `Prof.’ Blackman wants to lower the level of UK education even more.